Many bridges and port structures worldwide are supported on steel H-piles. H-piles allow for easy initial construction since the steel H-piles can be driven into ground fairly easily. 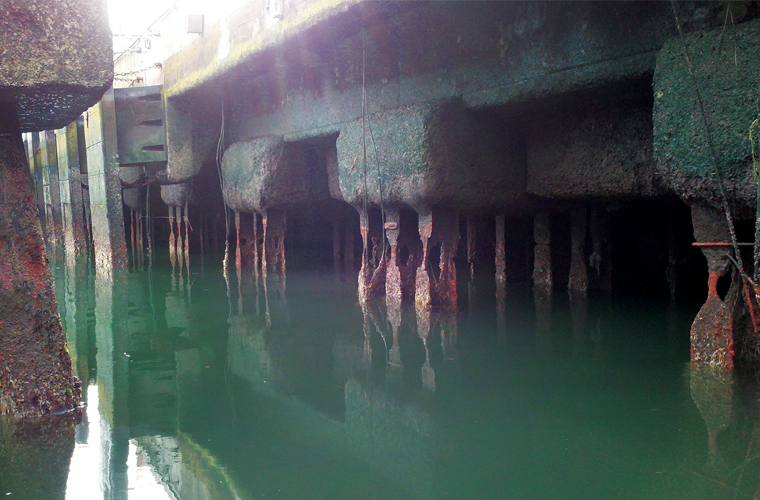 But with passage of time, the dry-wet cycle in the splash zone causes major deterioration of steel H piles. Our structural engineers will provide designs that enhance axial, flexural and shear capacity of the steel H-piles. The sealed engineering drawings and calculations will be provided to the client. A In some cases the corrosion is similar to an extensive pitting as shown here. While there may not be a major concentrated loss of cross section in these H-piles, nevertheless, the steel h piles shown here have lost significant axial and bending strength and must be repaired and strengthened to restore the original strength of the steel H pile. However, such restoration to original capacity is not an easy task. One approach to repair and strengthen steel H piles is by welding additional steel plates or shapes such as C Channels or steel angles to the deteriorated pile. Such repairs have their own problems. First, welding of new steel sections under water is a difficult and expensive task. Secondly, the difference in metals between the original steel H pile, the new steel sections and the weld material can lead to galvanic corrosion. Such repairs are not a permanent fix. A close look at the picture on the right reveals that the repaired steel H piles have lost a large portion of their web at the waterline. In August 2011, Texas DOT initiated a research study (Project:0-6731- Repair Systems for Deteriorated Bridge Piles) to evaluate some of the techniques for strengthening of corroded steel H piles. The 3-year study consisted of two parts. 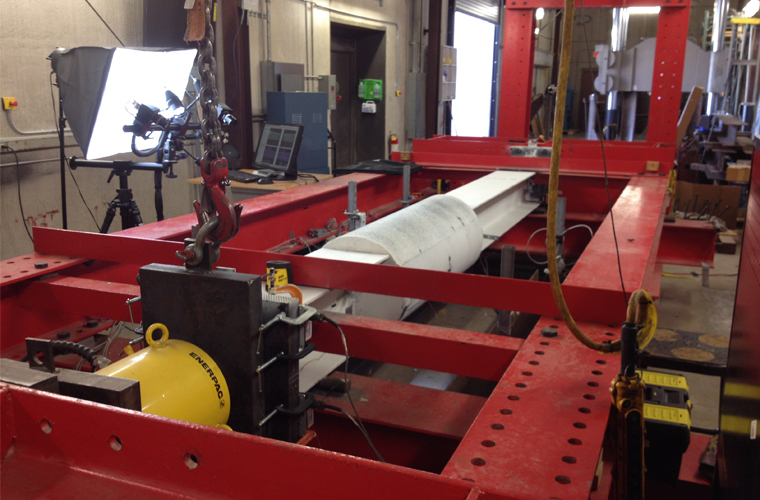 Structural performance of the jackets for both reduced- and full-scale piles was given to the University of Houston. Texas Tech University was given the task of evaluating the durability of the system. To simulate corrosion, different percentage of cross sections from the webs and flanges of these seven H piles were removed. The researchers wanted to perform the repairs in conditions closely resembling field conditions. The steel H-piles were placed inside a large steel tank that was filled with water. 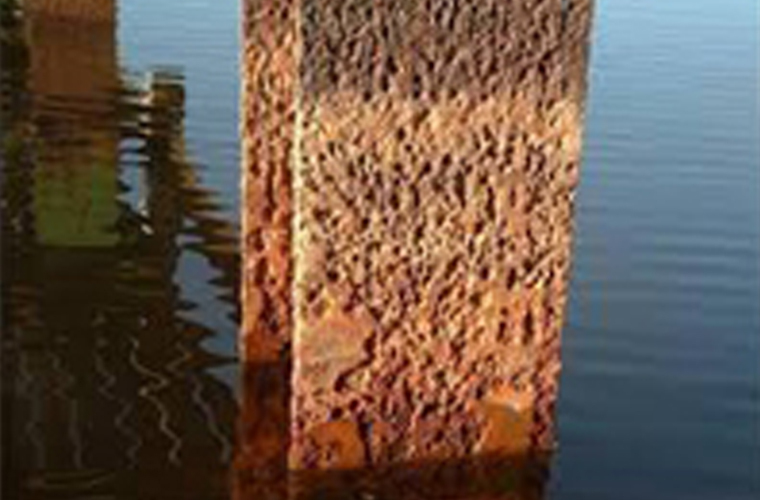 The damaged portion of the H-piles were wrapped in PileMedic® to create a solid seamless shell. Next, the portion of the H pile that was wrapped was filled with PileMedic® underwater grout. The pile was allowed to remain in that position while the grout cured. Testing of the large-scale H piles consisted of placing the specimens inside the red color test frame. For safety and ease of operation, the specimens were positioned horizontally in the test frame. Concentric axial load was applied to the repaired piles. The test had to stop after the jack applied a load of 658,400 pounds (2,930 kN) because the jack had reached its limit and could not provide any additional load! Nevertheless, the research team leader, Prof. Dawood, concluded that "at a minimum, the PileMedic® system restored the capacity of the deteriorated pile to its initial undamaged capacity". The final report on this study is available in pdf format here. Using a combination of unidirectional and/or biaxial fabrics, PileMedic® laminates provide strength in both longitudinal and transverse directions. PileMedic® laminates are manufactured in plants under high quality control standards; this improves the quality of the finished construction. The repairs can be completed much faster in the field. The strength of the laminates can be tested prior to installation. The number and pattern of the layers of fabrics in PileMedic® laminates can be changed to produce an endless array of customized products providing different strength values along the height of the pile or in the hoop direction. Additional coatings to the surface of the laminate can be added for abrasion and UV protection.